Walker designer and orchid expert, Andrea Hyde. Despite what the calendar says, spring hasn’t yet sprung in Minnesota. While waiting for the snow to melt and the soil to dry, Walker staff in the Home & Garden Club have found alternative ways to satisfy their green thumbs–orchids! Editor Kathleen McLean, who’s amazing at making sure every Walker publication is grammatically on track, is equally gifted in keeping a loving and watchful eye on the orchids that adorn our office space. 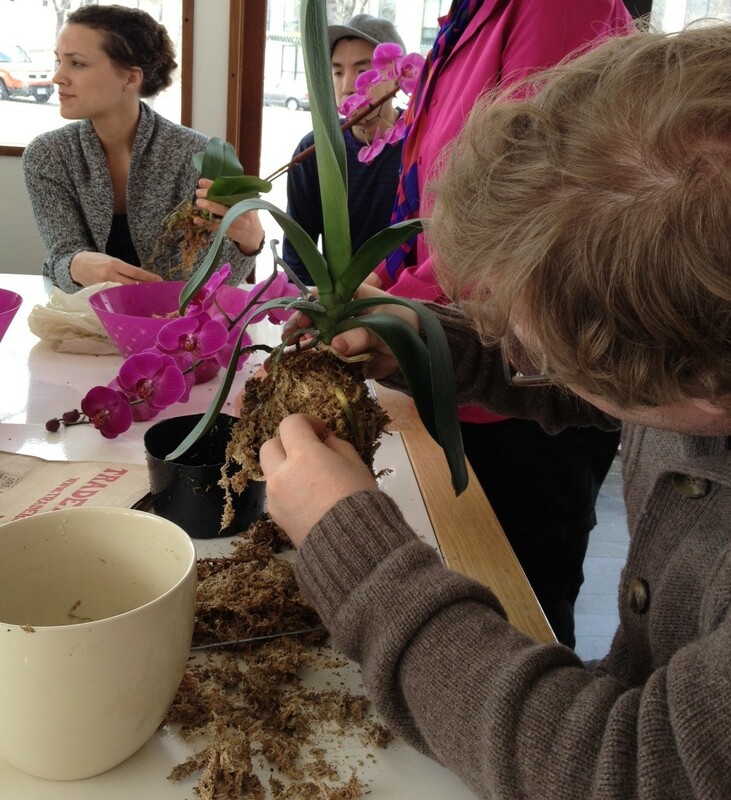 Known as the “Orchid Whisperer,” Kathleen recently led the group in a re-potting lesson over the lunch hour. Learning the how-tos of raising a proper Phalaenopsis (a common type of orchid) was a pleasant change of pace from the mental multitasking done at our desks. As we followed Kathleen’s lead and delicately removed the old moss and bark from the roots of the orchids we brought in from home, our hands and attention were fully absorbed. 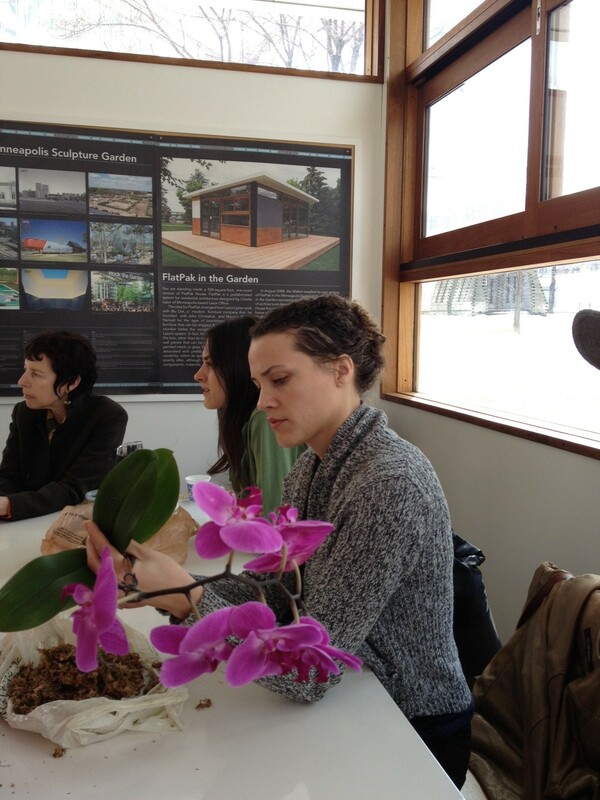 We became immersed in the space of the orchids, our peers, and the FlatPak, a light-filled pre-fab house in the Minneapolis Sculpture Garden. Some of us came to the table with a well-established love of orchids, especially designer Andrea Hyde. Andrea has had a healthy obsession with the plant since childhood, when she and her brother would enter their prize specimens to the Minnesota State Fair. At one point Andrea kept around 70 orchids, all in one room of her home, which demanded she spend the better part of her Sunday taking care of them. So what’s so alluring about orchids? To see one, the answer comes simply: they’re beautiful. 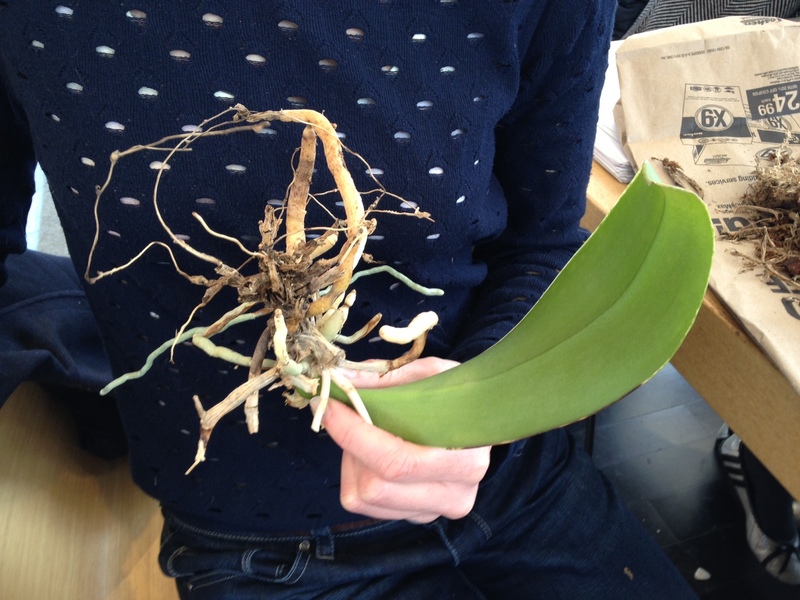 If you own one, the answer is more expansive: they’re patient, their bloom period is lengthy, and they’re easy to keep alive–although admittedly my orchid was suffering at the hands of its owner (see photo below). They’re also delicate but hearty, not surprising considering they occur in a wide range of habitats, from the tropics to parts of Minnesota! What I learned in the course of that hour, was hardly as important as how I learned it and with whom. The experience of slowing down with my colleagues, of getting our hands dirty, and appreciating the expertise of one another through the lens of orchid care, transformed our collective state of being. It felt radical to indulge in this simple pleasure together. Walker Home & Garden Club will share its love and knowledge of orchids with the public during the run of Fritz Haeg’s upcoming exhibition, Domestic Integrities A05. More information to come in the months ahead. Assistant Curator, Eric Crosby carefully removing the old moss around the root system. The author’s orchid is being resuscitated back to proper health. 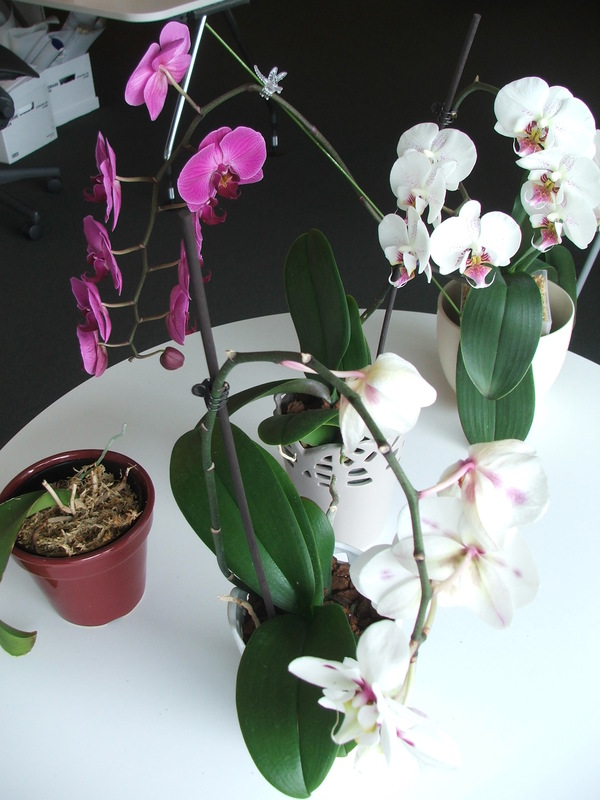 A collection of happy re-potted orchids in the Walker’s office space.